Don’t miss our first TeacherQuest webinar, “Learning by Doing,” on February 24, 2015, 4:00 p.m. PST/7:00 p.m. EST. Bill Wilson, featured in this article, will be one of our guests. TeacherQuest is a unique professional development program by Educator Innovator partner, Institute of Play, and focuses on games and game design. Through this 11-month program, which includes a summer intensive followed by a series of online design challenges, teachers learn to design and use games to develop 21st century skills. At Rankin Promise School, a small group of students are huddled around a deck of playing cards. They’re yelling out numbers and scribbling on sheets of paper. Each student is both eager and focused; they are “engamed” as teacher Bill Wilson calls it. A blend of game and engaged, it’s his term to describe learning through game play, a methodology he has been incorporating into his classrooms since he started in the TeacherQuest program last summer. Wilson teaches both math and reading at the fifth and sixth grade level at Rankin Promise, part of the Woodland Hills School District. Those who attend Rankin demonstrate a need for an alternative learning environment, or have special needs. Each student receives individualized academic support to help them succeed in graduating, along with professional counseling to enhance social and behavioral skills that carry into the real world. Teaching such a diverse group of students poses many challenges, but it also allows many opportunities. This school year, Wilson brings gaming into the classroom at least once a week, whereas last school year he almost never played games in class. After the TeacherQuest summer intensive, he was excited to put his new game-based learning skills into action and see how the students would react. During the first few months of school, he took it slow. He wanted his students to grasp the basics of working together and problem solving. 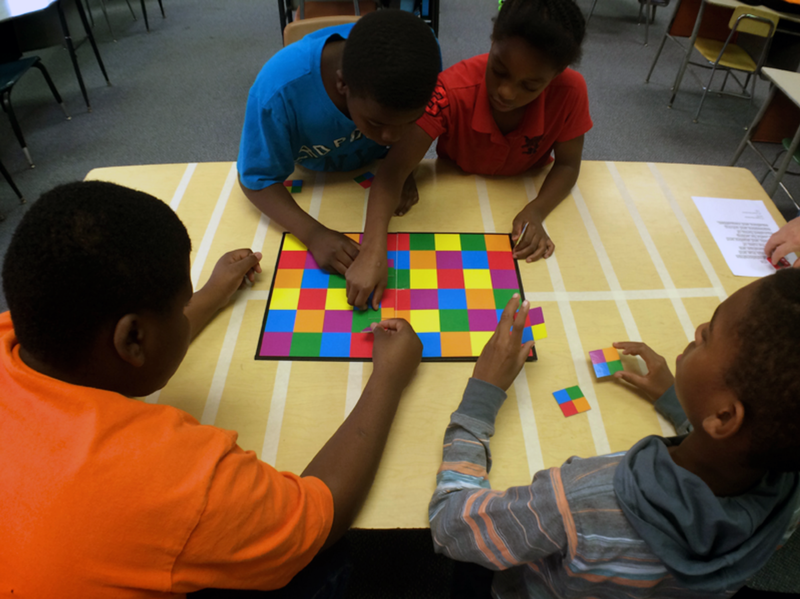 In a recent week, Wilson’s students played a few different games that focused on math: Rush 21, a mod of the fast-paced blackjack card game, and Kornered, a store-bought game that teaches spatial awareness and patterns. He ensures that the games he uses are aligned with district standards and that the needs of each student are being met. Wilson also debuted a new game he discovered called Fraction Flip It, which generated random fractions that students had to solve. The room buzzed with enthusiasm. While one student was shouting out an answer, another would be helping a friend with their cards. Gaming in the classroom has proved to be a success for Wilson, but he’s also faced some bumps along the way. Some days his kids are motivated to learn, and other days they need a little more coaxing to concentrate on the task at hand. His small class size of just four students has both worked for and against him. With so few students, games are limited to teams of two or individual play. Although Wilson continues to look for inspiration for new games and ways to modify existing games, he has yet to allow students to create their own games. He says they’re just not at that stage yet, but he hopes to get the kids designing their own games by the end of the school year. With the full support of the school’s administration, including principal Lamont Lyons (who attended a day-long session as part of the TeacherQuest summer intensive), Wilson is looking for a way to incorporate games as an assessment tool. Taking full advantage of the TeacherQuest online community where other educators in the program share advice, successes, questions, and challenges, he is learning just like his students. Wilson also inspires his fellow teachers with his own posts, especially his story about watching the Price is Right and coming up with a new spin on the game 4 in 40 that teaches students vocabulary in his English class. In the future, Wilson knows he will continue to use gaming in the classroom. One day he hopes to lead an afterschool program and to hold district-wide sessions for teachers who are interested in using games as a teaching tool. And he wouldn’t hesitate to return to another TeacherQuest program or to encourage his colleagues to get involved. But for now, you can find him and his students laughing, learning, and playing games.